Back to Basics: What is SEO? Posted on May 16, 2017 at 4:55 pm. Don’t know where to find sushi in your town? What is the first thing you do? You get on your laptop or phone and do a local search. Whichever device you grab, 75% of users you will only browse the first page of Google. You’ll click on the links that take you to the most relevant sites and within those first few seconds you will form an opinion on whether or not those services or products suits your needs. So how do those companies get on the first page of search engines like Google? How do those companies get ranked in the top 5 of a search engine? Some companies can pay Google to put their businesses on the top links but did you know 70-80% of users ignore the paid ads? So how does your company get found? The answer is search engine optimization, or SEO. Looking for digital marketing services that will blow your competitors out of the water? Contact us today to see how we can help. Search engine platforms promote the most useful material that is relevant to what you’re searching. In order to get into the top ranking spots, there are a combination of factors that come into play. Content Marketing – Blogs or writing articles about your products, services or company serves as a way to stay relevant. Search engine’s pick up on this and are able to pick up certain keywords being used and if people are searching for those terms. Social Media Marketing – Social media feeds are tremendous help in SEO as well. Social media correlates directly with your business ranking. If someone shares your content, then that content becomes visible to a broader audience. This allows your website to build traffic thus bringing in more click throughs building your influence and allowing your tweets or Facebook pages to come up in searches. Website Development – A good user interface is crucial to getting a good SEO ranking. When consumers search for a particular product or services, they want to search for a website that suits their needs. If your website is disorganized, not mobile friendly, slow, or not consice at to what is promoting, your click throughs can have a high bounce rate, making online visitors leave your site quickly and potentially lowering your rank. “SEO is a multilayer of different mechanisms that work together to get your business ranking higher. It’s essential in getting your business found in a digital age,” Jorge Ibarra. But successfully executing SEO strategies is no simple feat. It’s constantly evolving approaches and updates make it a revolving door of tactics and procedures. That’s where we come in. There are over 1.2 trillion global Internet searches conducted each month alone. Meaning that there are customers looking for your products or services. But with so many other businesses competing for customer’s attention it’s important to stand out from the crowd. Some businesses have a website but their social media can be subpar. Others can have a great social media presence but have a cluttered website. Some companies will have one or two of the three SEO components making their business harder to find when searching. 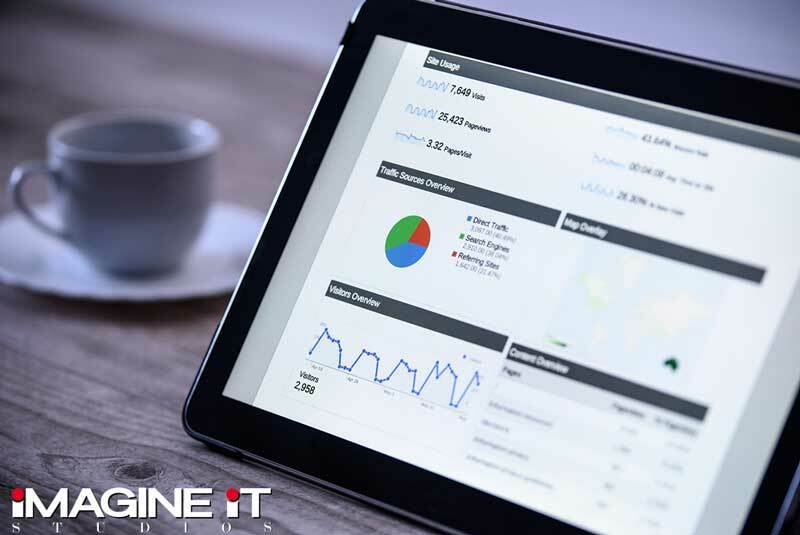 At Imagine It Studios, we take the time to understand your business challenges and goals to ensure that our quality SEO implementations provide better online visibility to showcase your brand. We provide consumer research, website evaluations and analytics, keyword search analysis and implementation, in-depth evaluations and information-rich content services that each work to get you the results you need. Contact us at our McAllen office today to get started!